For Starters, there is the Classic Caesar's Salad, created by Italian cook Caesar Cardini in the U.S. during 1920's when American pantries did not have much with which to cook because of hard times. The Italian culinary whiz just grabbed anything he could find and came out with this all-time favorite. How Chef Boy here plates and presents it is a marvel in itself. 1. Drain properly the romaine lettuce, and set aside. 2. Mix into bowl egg yolk, mashed peeled garlic, mustard. Pour slowly with olive oil until creamy. Add vinegar, at the last. 3. 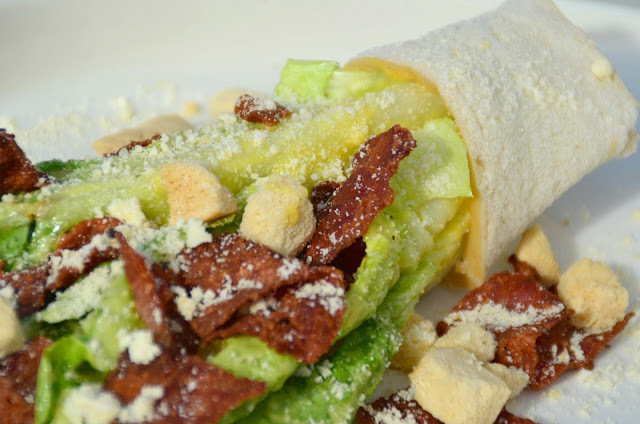 Tossed lettuce with Caesar’s Salad sauce then place it on salad bowl, over the top with bacon, parmesan cheese, and croutons.